HYDERABAD: TS Finance Dept approved to fill 325 Posts in Telangana Fire Department vide GO MS No.38 dated 16th Apr 2018. 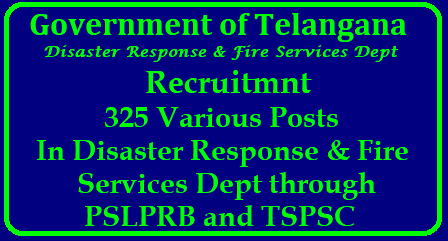 The finance department has accorded approval for various posts under Director General, Telangana Fire Department 325 Posts. These posts will be recruited through TSPLRB and TSPSC. The posts are Station Fire Officer, fireman, driver operator, typists, junior assistants and junior steno. The number of vacancies for fireman and driver operator is very high. The Home Department had sent a proposal to the Telangana state govt for the consent of direct recruitment on 2nd April this year. The government has reviewed the proposal for direct recruitment of vacancy position in Home Dept with reference to the nature of work and activities. The number of vacant posts in State Disaster Response & Fire Services is 325. Station fire officer 20 posts, fireman 169 posts, driver operator 129 posts and these posts will fill-up through TSLPRB. Typists 4, junior assistants 2, junior steno 1 post and these posts will fill-up through TSPSC. The Secretary of TSPSC (Telangana State Public Service Commission)/ TSLPRB may take necessary steps for filling the above vacancies. TSPSC/ TSLPRB shall obtain the details, such as local cadre-wise vacancy position, roster points and qualifications etc., from the concerned authorities. The Secretary of Telangana State Public Service Commission shall issue the notification and schedule for recruitment expeditiously.